announce the European tournee 2019! After record-breaking shows in New York, London and Asia, The Illusionists producers announced new, European performances for 2019. At the end of the 2017/2018 season The Illusionists set the sales record in: Marquis and Neil Simon (Broadway), Shaftesbury (West End), Sydney Opera House (Australia), Arts Centre in Melbourne (Australia) and in Auditorio Nacional (Mexico) theatres. After such massive success and becoming the best-selling Broadway show ever, The Illusionists are coming to Poland. The performances in ERGO ARENA will be held from Friday (March 22th) to Sunday (March 24th) 2019. 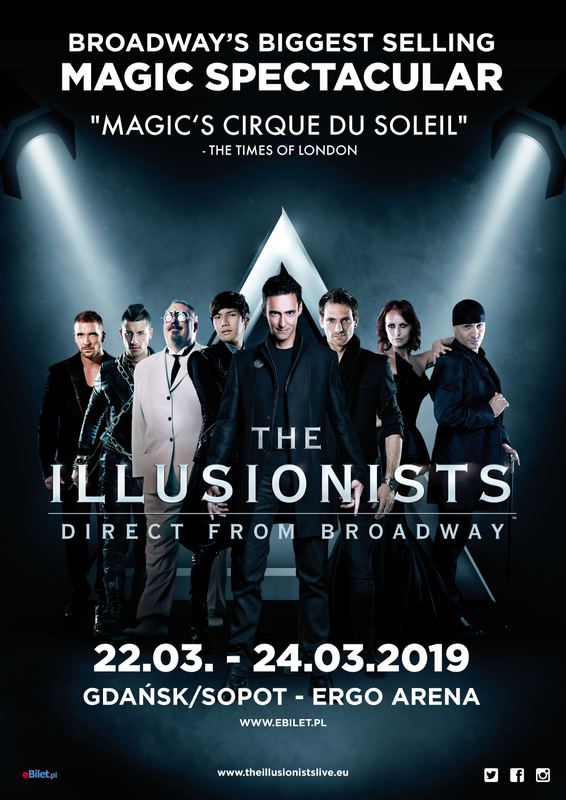 Among the best illusionists in the world who make this magnificent production are: Luis De Matos (The Master Magician), James More (The Deceptionist), Enzo (The Unforgettable), Andrew Basso (The Escapologist), Yu Ho-Jin (The Manipulator), Kevin James (The Inventor) and Sos and Victoria (The Transformationists). All of them were applauded by millions of viewers around the world. They surprise the audience with their greatest tricks together on one stage. Illusions, levitations, mind-reading and disappearing… The Illusionists: Live from Broadway amaze spectators of all ages with an absolutely amazing combination of the most exciting tricks that have ever been performed. ”We couldn’t believe our eyes! The Illusionists are great! Once the show was over our family was ready to buy new tickets and see it all over again. And again. And again!